The interior view of White Cone Senior Center shows the elders of the community just finishing their noon meal. (Times photo – Paul Natonabah) pn.white cone12 This pyramid shape hill is the iconic White Cone, located about five miles east of the new chapter house. The locals named their community after the landmark, which is visible from a great distance. In Navajo tradition, holy things come in groups of four: the four directions, four sacred mountains, four sacred colors, four sacred stones -- But four has not been a lucky number for this tiny chapter flanked on two sides by the Hopi Reservation -- at least not years ending in four. Eighteen-sixty-four, of course, was the year of the Long Walk (though some White Coners escaped by hiding in the rocky crags atop the mesas here). A hundred and 10 years later, in 1974, Congress passed the Navajo-Hopi Land Settlement Act which resulted in the partitioning of the Joint Use Area. White Cone lost its best winter range. All grazing permits were canceled. Although some people are still grazing their livestock without a permit, the range has come back considerably in 40 years. Last Wednesday, BIA officials met with former grazing permit holders in White Cone to tell them that if they collaborate as a range management unit and come up with a management plan, they could have their permits back "before Christmas." The news was met with a mixture of joy and suspicion. "Why do we need a plan?" asked an elderly lady in Navajo. "We're just going to take care of the land better than you would." "I think what we have here is a start," countered a man. "Where the Hopis live now, the grass looks good. They practice holistic grazing. We can do the same thing over here." But a discreet glance around the room revealed few permit holders under 70. It was hard to imagine they could muster the energy to restart ranches that had lain dormant 40 years. Name: "White Cone" is an obvious reference to the main landmark, an almost perfectly conical hill. The Navajo name, Be'ak'id Baa'a'oogeedi, means "excavated for a pond" and refers to an early trader's efforts to dig a well. Clans: Because this is a relocation area, many clans are represented here. Some of the major ones are Tábaahá, Totsohnii, Tl'’z’ Lán’, Tó Dich'’i'nii, Bit'ahnii, Kin Yaa'áanii, Táchii'nii, Tsi'naajinii. Famous sons: Code Talkers Sidney Bedonie, Arthur C. Brown, Earl Yellowhair and Carl Nez. Hastiin Gannie, a well-known medicine man, hailed from here. In fact, it's hard to see anybody under 70 throughout the chapter. The place looks like a neutron bomb hit it that only affects young people. White Cone High School, opened in 2005, closed in 2012 for lack of students. The Head Start has been shuttered for about three years. The senior citizens center, on the other hand, is the hoppingest place in town. That's not to say time has stood still here. The White Cone Multi-Purpose Building, built in 2010, houses a gym, the community services coordinator's office and plenty of meeting space. A new convenience store and gas station siphons travelers off Arizona Route 87, the shortest route between Hopi and Winslow. Melvin Willliams, 64, has lived here all his life and can tell you the history of all the buildings we pass. "JUA (Joint Use Area) house -- JUA house -- relocation house -- NHA scattered site house --," he ticks off as we drive through White Cone. The government-built relocation homes are nice when they have been kept up, but a lot look abandoned. "The owners pass on," Williams explains, "and the kids don't want to live way out here. What is there for them to do?" Good question. The high school and the convenience store were the only employers, other than the chapter. Now it's just the convenience store. But if you want to live in a place rich in culture and history, White Cone may be for you. 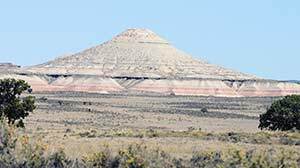 The White Cone itself, an almost perfectly conical hill, is considered so sacred by the locals that the chapter was forced to abandon a brand new cemetery built near it because none of the elders wanted burials there, Williams said. He points out caves in the cone where medicine men of old hid to capture eagles to get plumes for ceremonies. We stop to draw water at a sacred spring as Williams intones a prayer and sprinkles a little water on the ground. The hill itself represents a yei bi chi's arrowhead; the ancient lake levels on the surrounding red-and-white badlands represent the ye'ii's sash belt. "Every one of these hills and valleys has a story," says Williams, "but I can't tell you because it hasn't frosted yet." They fall in the realm of the Navajo winter stories, he explained, because they concern animals and holy beings, and tie in with the creation story. This was once desirable grazing land with a big lake, which you can still see depicted in one of the excellent murals inside the chapter house. The low, rocky mesas were defensive positions from which the Diné ambushed their foes. According to Williams, you can still occasionally find an arrowhead lodged in a juniper from some long-ago battle. But these days, White Cone is about as peaceful and quiet as you can get -- at least until the grazing permits are reissued. That might stir things up a bit.